The video above is a powerful reminder of those that have served. 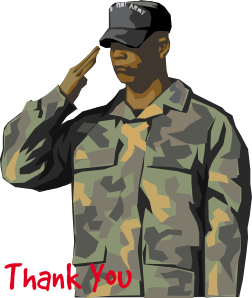 Take a moment today to thank a service member. Somewhere someone is missing a fallen comrade, a mother is wondering who her son would have grown to be, a wife is praying the other half of her heart gets home safely, a child is crying for their mom. Active service members can be, at times hard to forget, because they are there, their photos are flashed across the screen of our tv’s as fallen heroes, brave soldiers, and even those that are finally coming home. But sadly there are forgotten heroes. Tonight (and almost any other night) there will be approximately 300,000 vets sleeping on a cold park bench, in a wet tent, or in a shelter that offers warmth and maybe even a meal, but no real security. About 33% of the homeless males in the US are veterans, and the number of homeless Vietnam-era vets is greater then the number of soldiers who died during the war. The causes of this chronic homelessness range from lack of income due to their inability to find civilian jobs, combat related physical and or mental disabilities, substance abuse problems (most likely due to physical or mental disabilities), and poor social networks due to an inability to properly adjust to civilian life. No matter the cause, these numbers are simply inexcusable. No one deserves homelessness, but especially not those that have put their lives on the line. Will you consider giving to this important cause today? Visit Charity Watch-Veterans or your local veterans ministry to help. HI April, I think there needs to be better veteran care worldwide as it's not just in the US that former service personal are homeless and in need of help in re-integrating back into society. They have tremendous transferable skills, so there's obviously a disconnect in the leaving process. Sarah, I fully agree. There needs to be a better integration process, and a bigger support system when they exit the military.